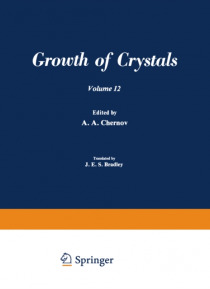 Volumes 11 and 12 contain the papers read at the Fourth All-Union Conference on Crystal Growth in Tsakhkadzor, September 17-22, 1972; this volume contains papers on crystal growth from melts, from low-temperature solutions, hydrothermal solutions, and hot solutions, and also from the gas state, including processes involving reactions. In addition, there are papers on crystal perfection in relation… to conditions of formation and the effects of electric and mag- netic fields on crystallization. These papers reflect researches directed to the development and industrial production of perfect crystals required for advanced techniques in solid-state physics and chemistry, as well as for other purposes such as novel materials. There are many different scientific and technical problems in producing large perfect single crystals, and advances in this area made in the USSR and elsewhere are reflected in the papers in both volumes. On the one hand, any particular defective structure in a crystal originates from some mechanism and growth conditions; in particular, inclusions are trapped on account of the physicochemical parameters of the melt, the surface processes, and the sta- bility of the growth front under particular crystallization conditions. Further, impurity trap- ping is decisively influenced by the surface kinetics, growth-front stability, composition and structure of the boundary layer, any complexes present in the liquid, and (of course) the crys- tallochemical relationships between the impurity and the crystal.